The UA Department of Art and Art History cordially invites you to two exhibitions by degree candidates in studio art. 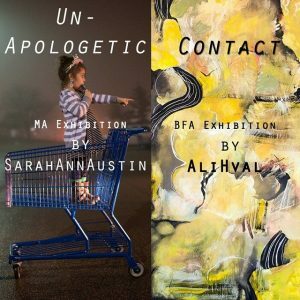 The Sella-Granata Art Gallery will be host to Unapologetic, an MA exhibition by Sarah Ann Austin and Contact, a BFA exhibition by Ali Hval. The dual exhibition begins April 13 runs through April 24, 2015. Please join us for an artists’ reception April 17 from 5:30-8:00 pm. Sarah Ann Austin’s photographs recently have been juried into nationally recognized exhibitions. Two works were selected for the 2015 SPE Combined Caucus Juried Exhibition at the Society of Photographic Education Conference, Ogden Museum of Southern Art in New Orleans. Another photograph was chosen for the 2015 Joyce Elaine Grant Photography Exhibition at Texas Woman’s University juried by April Watson, curator of photography at the Nelson-Atkins Museum of Art. More of Austin’s photography is here. Austin’s exhibition is in partial fulfillment of the Master of Arts degree. For more information on the graduate programs of the UA Department of Art and Art History, visit this link: http://art.ua.edu/site/programs/graduate/. Ali Hval exhibited her large textile sculptures in March at the BFA Juried Exhibition in the UA Gallery at the Dinah Washington Cultural Arts Center in Tuscaloosa. Hval’s exhibition is in partial fulfillment of the Bachelor of Fine Arts degree. The BFA is the professional degree for the artist; it is also the foundation for the masters program in studio art at UA. For more information about the BFA degree, go to http://art.ua.edu/academics/undergraduate-programs/babfa-in-studio-art/ or contact the department at (205) 348-5967. Gallery hours are Monday through Friday 10:00 – 4:00 p.m. The gallery is located at 109 Woods Hall in the heart of the UA campus on Woods Quad. Information about visitor parking is available here: http://bamaparking.ua.edu/visitor-information/. Parking is free on campus in a legal space after business hours.